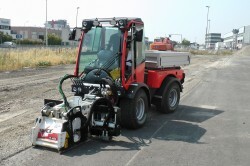 The multifunctional implement carriers with articulated steering from Holder are perfect partners for all-season use – in cities and municipalities, for local service providers and also at airports. Thanks to their agility, robustness and versatility they are perfect for all cleaning, maintenance and clearing work coming up. At international airports such as Zurich, Berlin, Istanbul, Beijing, or Ottawa, Holder implement carriers have become indispensable. 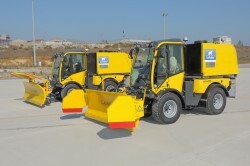 With clean and free paths they ensure a safe transfer of passengers from the parking lot to the terminal. Max Holder GmbH is a renowned manufacturer of multi-functional tractors with articulated steering for municipal applications. Whether winter services, lawn care, walkway cleaning, transportation tasks, earth movement, plant protection, greenery work, or numerous special applications – customers in many countries rely on the Holder brand. The traditional German company from Metzingen, which was established in 1888, offers complete solutions and services from a single source: multi-functional carrier vehicles, suitable attachment technology, individual services and flexible rental concepts. The Holder product range offers four different series from 27-92 hp. They all have in common articulated steering, permanent hydrostatic four-wheel drive, 4 wheels of equal size and wheel load balance. Mechanical PTOs, up to 120 liters of hydraulic power and extreme payload (about 1800 kg possible) support heavy duty applications throughout all seasons. Standardized interfaces allow a quick and easy change of attachments. 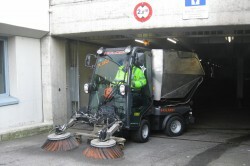 Vehicle widths from less than 1 m and heights from less than 2 m ensure unrestricted functional ability even on pavements and in underground car parks. The modern and comfortable cabins with 360° range of vision, air-suspended driver’s seat and multi-functional joystick guarantee a stress-free working day. More than 150 professional Holder partners in over 30 countries world-wide will assist you with the vehicle configuration, with practice-oriented service offers as well as individual renting, leasing and financing solutions. 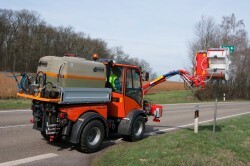 Holder implement carriers were designed for professional use under the most stringent conditions. Each of our tractors incorporates passionate high-quality German engineering, 125 years of experience and the fascination of a traditional brand. Experience the special feeling of a Holder yourself – by visiting our website, by talking to your Holder partner, by test-driving one of our tractors or by visiting our customer center in Metzingen.